The Trump administration is proposing a drastic change to how millions of people in the U.S. receive food stamps by replacing cards with an equivalent cash value with a "Blue Apron-type" delivery box of food purchased by the government. Unlike Blue Apron, which includes meat and produce, the food delivery box would include only shelf-stable foods like canned goods, rice and pasta, and other processed foods. The proposal also says that all of the products will be grown or sources in the U.S. and would represent a portion of that household's food stamps allotment. USDA calls the food delivery program "America's Harvest Box." Trump infrastructure plan: Sarah Bloomquist reports during Action News at Noon on February 12, 2018. In 2017 about 42.2 million people participated in the Supplemental Nutrition Assistance Program, more casually known as food stamps. The government paid more than $68 billion to provide benefits of an average of $125.79 per month for each person. The U.S. Department of Agriculture developed the food delivery box idea internally and Office and Management and Budget Director Mick Mulvaney said in a briefing Monday that Agriculture Secretary Sonny Perdue "wanted to give it a chance." "USDA America's Harvest Box is a bold, innovative approach to providing nutritious food to people who need assistance feeding themselves and their families - and all of it is home grown by American farmers and producers. 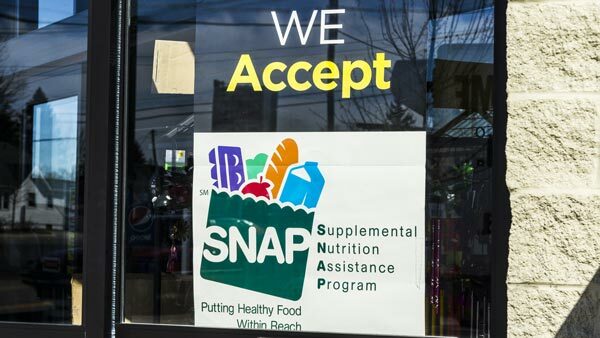 It maintains the same level of food value as SNAP participants currently receive, provides states flexibility in administering the program, and is responsible to the taxpayers," Perdue said in a statement. The 2019 budget proposal says that the box program would cut SNAP costs in half by allowing the government to buy in bulk. Over the next 10 years it says the government would spend $129 billion less on the program, citing both the savings on retail costs and declining participation in the program. Mulvaney likened the idea to a "Blue Apron-type program where you actually receive the food instead of receive the cash. It lowers the cost to us because we can buy prices at wholesale, whereas they have to buy it at retail. It also makes sure that they're getting nutritious food. So we're pretty excited about that. That's a tremendous cost savings." A memo on the "Harvest Box" program says it will be up to states to figure out how to distribute the boxes through existing partnerships or "directly to residences through commercial and/or retail delivery sources." The budget proposal does not include any funding for distributing the boxes. The president of Feeding America Matt Knott said food stamps are designed to be the first line of defense against hunger and that the infrastructure of food banks and other charities wouldn't be able to make up for the cuts. Cuts to food snaps and other programs like it typically face a tough fight and could be removed by the agriculture committees, who typically take up any changes to the program in the Farm Bill that is reauthorized every five years. The Republican chairmen of the House and Senate Agriculture Committees released a joint statement Monday saying that the budget will not prevent them from doing their job of producing a Farm Bill that benefits farmers, consumers, and other stakeholders. Other advocates said that the food box proposal was more of a distraction from other cuts and changes in the proposed budgets, like support for additional work requirements that could make it harder for some people to be eligible for benefits. Current USDA requirements say that able-bodied adults without children can only get three months of food stamps in three years unless they work or participate in a job training program at least 20 hours a week. USDA would likely not change that requirement but could grant states waivers to impose stricter requirements at the state level. The USDA's budget proposal says that the agency plans for 1.4 million fewer people to receive benefits in 2019. "Under the guise of being "helpful," the Harvest Food Box is a sham that takes away healthy food replacing it with fewer choices, said Monica Mills, executive director of Food Policy Action. "In addition, we must also fight against the other proposed eligibility and benefit cuts to SNAP that are just as radical and likely to gain traction in Congress. These budget proposals for SNAP are the wrong way to go to provide healthy, safe, affordable food for all." Knott also said that the program is designed to help vulnerable populations like veterans returning from combat or seasonal workers who would lose benefits if they aren't working for several months.